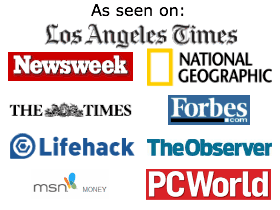 There’s been such great reviews about Ozark Trail Tumbler and how it is giving the Yeti Rambler a run for its money. Is Ozark Trail just as good as Yeti? Here’s why we love ours. In the Yeti vs Ozark Trail competition, there are many factors to consider. Both stainless steel tumblers are made in China. They are made with food-grade 18/80 stainless steel and are BPA-free. They are equal on this point. Both the Ozark Trail tumbler and Yeti tumbler seem to have the same high quality, vacuum-insulation. They are both double-walled. They both keep ice from melting for hours. Even in a hot car with the windows closed (and I live in HOT Arizona). In both of these vessels, your drinks will stay hot for hours longer than you will need. They both are superior on this point. Both tumblers come with a lid. These lids are designed to sip out of, not to use with a disposable or reusable straw. You will be able to work certain brands and types of straws in it but the lids’ designs aren’t meant for straws as they aren’t circular. Yeti has a great lid on Amazon. 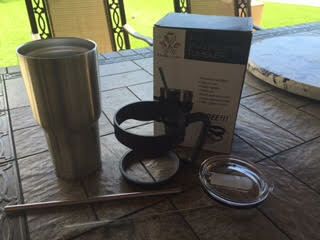 It’s called the Yeti Rambler straw lid and it fits the Ozark Trail tumbler too. It comes with a shatter-proof lid and a reusable straw. What’s great about this lid is it’s meant to fit a straw as it has a circle opening. I like how having this lid adds more versatility to the Yeti and Ozark Trail tumblers. There is a notch to stop the straw from coming out of the drink but it doesn’t make it leak proof. We love using a straw to drink from, especially while driving. Using the Yeti lid that is meant to be used with a straw makes it so much safer to drive and sip as you don’t have to tip the tumbler up. I also like it better for work, meetings and on-the-go in general. The lids from both Yeti and Ozark are great. 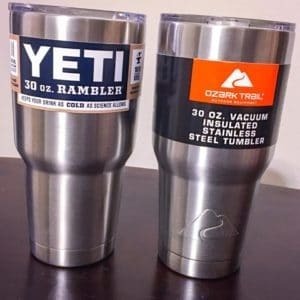 I have been using the 30 oz Ozark Trail tumbler and the 30 oz Yeti Rambler for a true comparison. Both brands offer a 20 ounce size as well. Both Ozark and Yeti are equal in this round with the 20 ounce and 30 ounce tumblers. 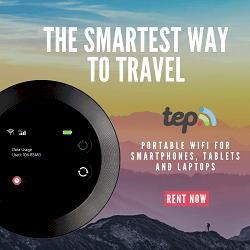 These make great gifts, especially for couples. We have several of each brand in our home. Ozark Trail and Yeti both offer two packs in 20 oz and 30 oz sizes. Ozark Trail and Yeti tumblers are made with stainless steel which is easy to clean. They aren’t porous like plastic tumblers so they won’t stain or retain odors. The cleaning instructions for the Ozark Trail say to only hand wash it. I imagine this is because of the vacuum seal; however, the directions for the Yeti tumblers say they can be put in the dishwasher, including the lid. Score one point for Yeti. I love being able to use the dishwasher to be sure it’s clean and for the convenience. Overall, the Ozark is less expensive than Yeti. Ozark tumblers definitely have the advantage on price. The only complaint I might have is that in the 30 ounce size, both are a bit difficult to grip if you have small hands. A petite person or child may find the 30 ounce size to be a bit of a challenge to use. However, this is a non-issue for me and will probably be for most people. You will be happy to know that unlike stainless steel water bottles of the past, these insulated tumblers won’t freeze your hands when you have cold drinks or burn them with your hot beverages. In the Ozark Trail vs Yeti showdown, Ozark Trail beats Yeti. Walmart’s Ozark Trail brand has a lifetime warranty. Yeti has a generous 5 year warranty, which is longer than I usually use any tumbler or water bottle anyway. Neither the Ozark Trail nor the Yeti are designed to be leak proof, unlike insulated stainless steel water bottles. Also, they aren’t designed for people to take them hiking or for kids to put in their backpacks for school. Update: We just bought this other 30 ounce tumbler. This set includes a 30 ounce Kitchen Leaders stainless steel tumbler, a sliding lid, straw, straw cleaner, and best of all — the handle too. We wanted to review a generic version to see how it compared to the now-popular Ozark and the legendary Yeti tumblers. This brand is made with the same type of 18/8 food grade stainless steel as the Yeti, RTIC tumbler and Ozark Trail. It seems to be the same quality tumbler as more expensive competitors; you just aren’t paying for the Ozark Trail, Yeti or RTIC name. The handle makes it more convenient to hold, and the straw cleaner is great to be sure you are really cleaning the straw, not just running water through it. When comparing the Walmart Ozark Trail vs Yeti brands, you basically need to consider the cost and whether having a “brand name” is worth the extra money. 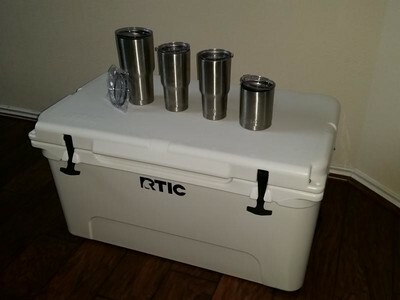 It’s true, Yeti is a forerunner in making legendary products, starting with their flagship product, the Yeti cooler. 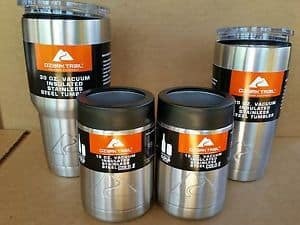 However, if you are simply looking to be able to tote your drink while keeping cold drinks cold and hot drinks hot, without using dangerous plastics, the Ozark Trail tumbler is the way to go.